Do you want to freshen up your memory or are you just new to the world of 3D printing and want to learn about the three classic 3D technologies? Look no further, we got most of the details available here. Choosing a technology to print out a prototype, a proof-of-concept or any object at all will depend on what is expected out of the object. Each technology has their own set of strengths and weaknesses and will define the characteristics of the printed object. 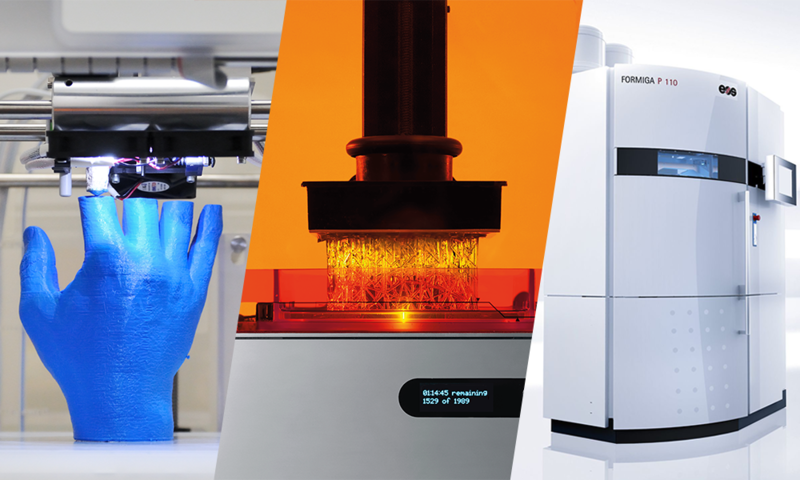 This week, we will be looking at three most used types of 3D printer technology: Fused Deposition Modeling (FDM), Stereolithography (SLA), CLIP, and Selective Laser Sintering (SLS). The most democratized additive manufacturing method, Fused Deposition Modeling works by extruding a thermoplastic polymer through a heated nozzle and depositing it on a build stage. FDM machines are the most affordable, especially for individuals that do not have a company’s budget. Many brands today are available pre-built like MakerBot and Ultimaker, two of the most popular desktop 3D printers, or can be built using DIY kits or going from the grounds up and printing parts to create a 3D printer. The concept behind FDM printers is simple: a plastic filament runs through the nozzle and melts when in contact while being gradually deposited in a structured way until the object is finished. The plastic used in FDM are generally ABS (Acrylonitrile Butadiene Styrene), PLA (Polyactic Acid) and Nylon (Polyamide), but other exotic varieties of materials can also be used, like a material blend of plastic and wood or carbon. Stereolithography was one of the first additive manufacturing technologies to be theorized and patented in the 80s. The concept behind it, though there are many variations today, is quite simple: a near-UV laser beam is focused and quickly draws a 2D section of the design on a thin layer of liquid photopolymer resin. The photosensitive resin polymer then reacts and solidifies forming a single 2D layer of the design. Depending on whether the laser comes from below (like the above image) or from above, the object is raised one layer depth while still in contact with the resin, or a new layer of resin is applied to the object, respectively. Then the process is iterated for each new layer of the design until the 3D printed object is complete. The final step is to clean the completed object soaked in resin and remove the eventual support structures. SLA has also seen a popularity as desktop 3D printers but is usually sold pre-built like the Form 2 from Formlabs or the Ember from Autodesk. However, such printers are much more expensive than FDM printers, as their costs range from the thousands of dollars/euros ($3,499 for the Form 2, $5,995 for the Ember). CLIP stands for Continuous Liquid Interface Production. This 3D printing technology works by projecting a continuous sequence of UV images, generated by a digital light projector, through an oxygen-permeable, UV transparent window, below a liquid resin bath. It creates a dead zone above the window which maintains a liquid interface below the part. Above this dead zone, the cured part is drawn out of the resin bath. This 3D printing technology was first introduced in February 2014. A few months later, the company Carbon 3D was created to commercialize it. Thanks to the Carbon CLIP technology, we can 3D print parts with high mechanical properties. These parts are as precise as SLA printed parts and can be 3D printed much faster thanks to the continuous process. Thanks to the engineering resins, you can obtain flexible material or highly resistant one for technical parts. To learn more about the CLIP resins, you can visit our dedicated material page. Last but not least, the technology mostly used at Sculpteo: Selective Laser Sintering. The concept is quite simple, but the execution is usually reserved to professional companies and online 3D printing services as ours, since SLS printers are usually large (as large as a double door American fridge) and costly. To summarize the idea behind it, a powder from a container is swept upon the build stage by a recoater, a laser then selectively scans the thin layer of powder, sintering together powder particles in the shape of the cross-section of the first layer of the design, as we can see in the image above. The build platform is then lowered one layer depth and the recoater applies a new coat of powder. Just like the first layer, the second cross-section of the 3D design is scanned and sintered while being adjoined to the first layer making a solid part. The process is iterated until the object is completed. The tray containing the completed object is then removed, and the objects are de-powered. No further process is needed, apart if you want to apply any additional finishes (paint, polish, dye, smoothing beautifier…). Compared to stereolithography and FDM, SLS does not require support structures since the powder acts as a self-supporting material. This allows intricate and complex geometries to be constructed, there is an almost complete design freedom. However, the cost of a machine is pretty steep, which is why it is mainly used for industrial applications. Sculpteo, however, has made it available for everyone! A lot can be said for each technology, as new printers come out every year with all new characteristics. However, to try to generalize trends, we set out to define a table with general terms and components to define each technology to enable everyone to choose between them according to their needs and wants. For more information about the technologies or materials, you can go check out our blog on SLS vs. SLA which goes further into details of each technology, our comparison page on FDM vs. SLS which shows examples of both technology and compares them, or our glossary pages on SLS, FDM, SLA, Nylon, ABS, and much more. Discover our metal 3D printing service with DMLS, SLM and Binder Jetting technologies. Learn more about the metal 3D printing technologies thanks to this blogpost.